Every now and then, we all have those nights where we spend more time tossing and turning than resting in a deep slumber. New research shows that these nights aren’t just bad for your alertness the morning after. They could contribute to the damage that leads to Alzheimer’s. In a study published in JAMA Neurology, researchers at Johns Hopkins Bloomberg School of Public Heart found that people who have poor sleep are more likely to have elevated brain levels of the toxin beta-amyloid. This toxic protein forms plaques in the brains of people who have Alzheimer’s disease. Participants were all over 70 years old, with a mean age of 76. Brain scans showed that those who got fewer than five hours of sleep each night and those who had fitful sleep had higher levels of beta-amyloid than those who slept seven or more hours each night. 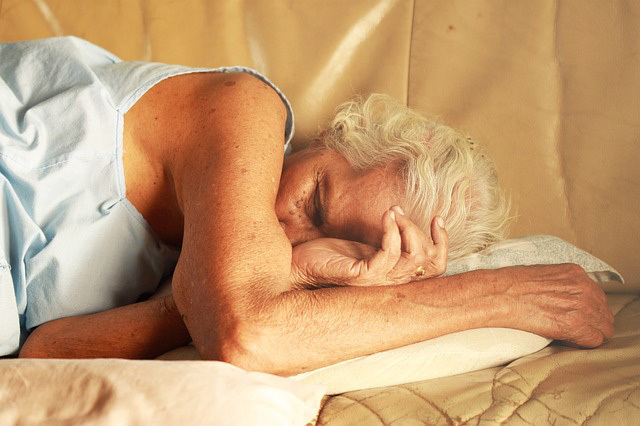 At the current time, it’s unknown whether lack of sleep causes excess beta-amyloid or whether heightened levels of the protein lead to poorer sleep. In other studies on sleep, people who do not get adequate sleep have trouble consolidating memories; that is, they have trouble making memories stick so that they are able to be recalled accurately later on. Poor sleep has also been linked to poor cognitive performance and difficulty processing information. Do not consume caffeine in the later part of the day. Caffeine in the evening can inhibit sleep hours after it is consumed. Stick with a cup or two of coffee in the morning, and switch to caffeine-free beverages like herbal tea or lemon-lime sodas in the evening. Ensure that the room where you sleep is dark. Lights from computer screens, digital clocks and power strips can keep us from falling into deep sleep. By providing a dark place to sleep, you can stimulate the release of melatonin, which relaxes you and eases you into deep sleep. Do not use your tablet or smart phone in the dark. The white-blue light of these devices signal to your brain that it is daytime and time to be up and awake. Go to bed and wake up at the same time each day. Staying on a regular schedule makes it easier for your brain to fall into routine. Exercise regularly, but not too late in the day. People who engage in moderate aerobic exercise fall asleep more quickly and sleep more deeply. Even a 15 minute walk can be helpful. Make sure you exercise at least two hours before bed so that you are sufficiently relaxed and ready to sleep. We’re still developing our understanding of how sleep and brain function interact. But, by taking steps to improve your sleep each night, you can improve your health now and possibly cut your chances of developing Alzheimer’s and dementia later on. The residential and adult day club programs at Primrose, our care home for those with dementia in Santa Rosa CA, incorporate the latest research on what is needed for individuals facing memory loss. Contact us today for a tour or more information!